The AHS Health Plan and Business Plan is a public accountability document spanning a three-year time frame. It describes at a strategic level the actions AHS will take in carrying out its legislated responsibilities with a primary focus on delivery of quality health services. Health Plan and Business Plan development is guided by direction received from Alberta Health and is aligned with and supports the Ministry’s business goals. A key feature of the plan is ensuring that mechanisms for measuring and monitoring results and achievements are identified. These objectives and outcomes will propel us toward our vision and outline our commitments. 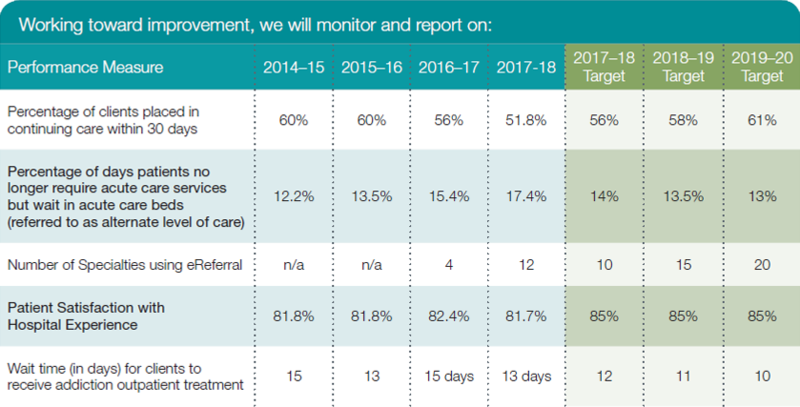 Within three years, Albertans can expect a stronger, more integrated provincewide health system from Alberta Health Services (AHS). We are focusing our actions on increasing care in communities, achieving better health outcomes, and continuing to work on sustainability. By putting these operational goals into action, AHS will emerge better positioned to meet the health needs of Albertans today and in the future. We are also supported by work done to date finalizing an AHS vision, mission and values, as well as four foundational strategies that focus on our people, our patients, research and innovation, and the information management and information technologies required for a best-practice healthcare system. Below are the goals with their related objectives and examples of the priorities we are undertaking to achieve these goals. We have also defined performance measures and targets over this three-year health plan, which will enable us to evaluate our progress and allow us to link our objectives to specific results. In this way, we can track the differences we make to Albertans. To achieve better health for all, we must take a different approach to the planning and design of services, ensuring our health system is integrated and co-ordinated between providers and patients. This will improve the experiences of patients and will lead to improved clinical practice, a more co-ordinated approach to team-based care, and more satisfied patients and staff. We will work to make the transition from hospital to community-based care options more seamless. We will strive to make it easier for patients to move between primary, specialty and hospital care. We will respect, inform and involve patients and families in their care while in hospital. We will work to improve access to community and hospital addiction and mental health services for adults, children and families. Increase capacity in continuing care by enhancing home care supports in communities across Alberta and, where appropriate, adding additional continuing care spaces with an emphasis on long-term care and dementia. Work in partnership with Alberta Health to better support integration across the continuum of patient care and support patients along their respective clinical pathways. Develop a clear plan that supports the implementation of the Valuing Mental Health Action Plan. Continuing to apply our Patient First Strategy will enable us to advance healthcare by empowering and supporting Albertans to be at the centre of their healthcare teams. 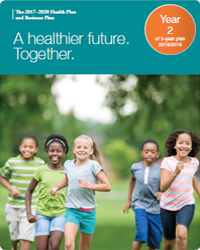 We encourage Albertans to be co-partners in health. To reflect this, we actively engage with patients and families, staff and physicians, volunteers, local communities and other health partners. Together, we are building a health system that gives patients control over factors that affect their health, improves service quality, promotes leading practices, consistently applies standards, and increases local decision-making. We will strive to improve health outcomes through clinical best practices. We will work to improve the health outcomes of Indigenous People in areas where Alberta Health Services has influence. We will work to reduce and prevent incidents of preventable harm to patients in our facilities. We will focus on health promotion and disease and injury prevention with an emphasis on childhood immunization. Increase the capacity for evidence-informed practice and policy through clinical information systems, enhanced data sharing, research, innovation, health technology assessment and knowledge translation. 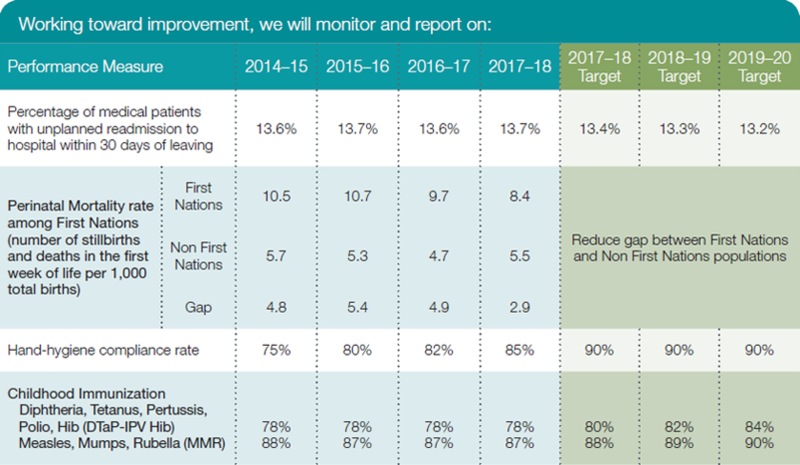 Support reducing the health gap between Indigenous and non-Indigenous peoples by developing population and public health initiatives, including increasing the number of Indigenous communities that receive appropriate health services. Support the improvement of: women’s health; maternal, infant, child and youth health; and, the health of the vulnerable and those in need or expressing need. Support health protection initiatives in the areas of environmental public health, food safety, immunization, and infection prevention controls. Actively contribute and lead, where appropriate, in the management of health crises and disease outbreaks. AHS continues to work together with Alberta Health, health professionals, first responders, law enforcement and community organizations, to address the opioid crisis and offer programs, services and supports that reach Albertans. We have a skilled and dedicated workforce of health professionals, support staff, volunteers and physicians who promote wellness, prevent disease and injury, and provide healthcare to a diverse population every day. We also host students from universities and colleges, providing clinical education experiences. We will strive to improve our workforce engagement. We will work to reduce disabling injuries in our workforce. Alberta Health Services is creating an adaptable and resilient workforce, building leadership capabilities and effectively engaging our staff, physicians and volunteers. AHS is committed to fostering an inclusive workplace that supports the health and safety of our people, and builds a culture where people enjoy what they do and remain committed to the purpose of helping others. * Employee engagement rate is based on a five-point scale, with one being ‘strongly disagree’ and five being ‘strongly agree’ for overall satisfaction AHS employees responded about the work they do at AHS. ** Disabling injury rate is the count of disabling injury claims per 200,000 hours based on Alberta Health Services (AHS) paid hours. A disabling injury is defined as any Workers Compensation Board (WCB) claim resulting in lost time and/or modified work. As we face service and cost pressures, we will continue our efforts to manage expenditure growth and to maximize the value of each dollar we spend to remain within provincial budget targets. We have to evolve and adapt to a changing system with increasing demands. This requires innovation to work differently, while maintaining quality and safety. We must also make difficult decisions in the coming years to contain costs and become sustainable, and guide future planning to reach positive financial health. We will work to improve efficiencies through implementation of operational and clinical best practices while maintaining or improving quality and safety. We will work toward integrating clinical information systems to create common, comprehensive patient records. Develop service plans that identify the appropriate programs and services that will deliver effective healthcare locally. Develop virtual, technology-based solutions with a focus on vulnerable and rural populations. Consider and pursue new service pathways and models of care which would see care delivered in the community in partnership with Alberta Health, other ministries, the voluntary and commercial sector, and communities in both their development and implementation. Focus on quality and health outcomes as priorities of the Strategic Clinical Networks by reducing inappropriate variation in service delivery and development, and application of consistent clinical standards and service specifications across AHS. Improve access to information by supporting Alberta Health in enhancing and expanding Alberta Netcare and the Personal Health Portal to assist Albertans in taking an active role in managing their health. There is no AHS measure identified for clinical information systems. We will monitor our progress over the next three years through the accomplishment of our actions (key milestones and deliverables).